Goalball is a sport for vision impaired athletes where the players defend their goal by trying to be hit by a large, heavy ball, thrown as hard as possible. And both the throwers and the defenders wear blackout goggles. Teams of three are positioned at opposite ends of a court and take turns to hurl the ball at their opponent’s goal, which extends the full width of the court. While the ball may be bounced, there are zones on the court in which the ball must touch the floor, so that when it reaches the defenders the ball is rolling or low above the playing surface. Defenders stop the ball by throwing themselves on the floor and extending their arms and legs to cover the maximum area. Originally played with a 2.0 kg ball about the size of a basketball and containing bells, it is reported that broken ribs, noses and other injuries have decreased since the weight of the ball was reduced to 1.4 kg. 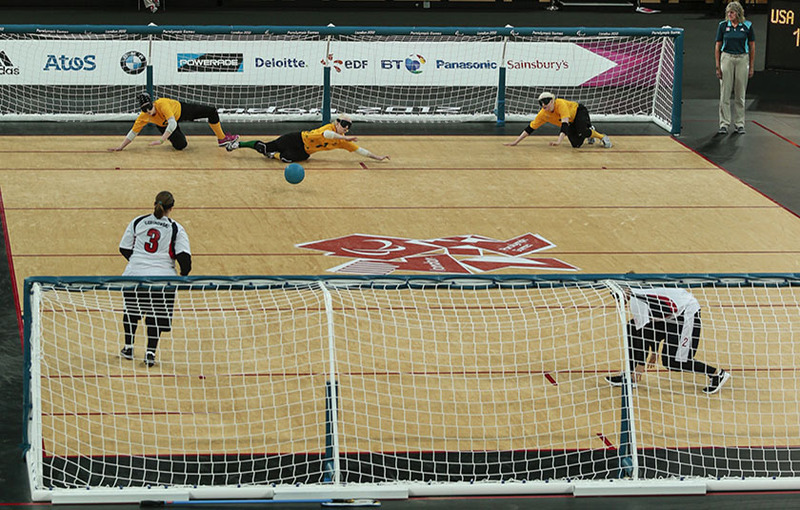 A Goalball rally takes place in silence from the spectators, so that the players can use their hearing to identify any noises of the thrower and the direction and speed of the ball. Goalball was developed after the Second World War, as a rehabilitative activity for newly blinded soldiers, to help them to gain skills necessary for their new situation without sight. Belgium, Austria and Germany all claim to have developed Goalball and all have been involved with Goalball since the mid-1940s. In other countries, Goalball was introduced through the 1960s and 70s. Communications were often poor and teams were assembled on the spot, even for international tournaments. In 1976, when Goalball was played at the Paralympics for the first time, the USA team learned the rules of the game in the bus on their way to their first match. At the 1980 Paralympic Games, Terry Kenaghan was the Blind Team Manager and Deputy Overall Leader of the Australian team. When he found out that Goalball was being played in Arnhem, he registered an Australian team. After the Games, Kenaghan distributed rules and information throughout Australia. The following year the Australian Blind Sports Championships included Goalball as an event, and teams from NSW, WA Victoria and Queensland competed. In 2012, Kenaghan’s daughter, Goeorgina Kenaghan, coached the Australian women’s Goalball team at the London Paralympics.